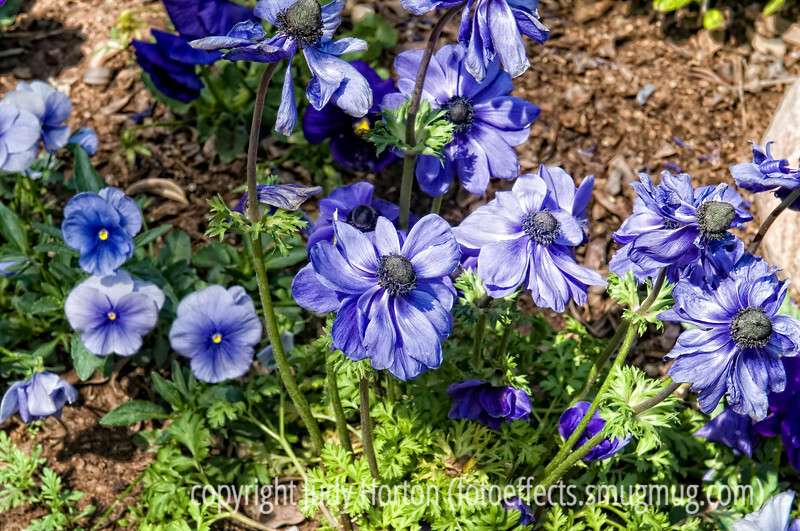 Blue anemones and pansies; please view this image in the largest sizes. The detail is really nice, I think. These were photographed at the Boyce Thompson Arboretum near Globe, Arizona. Nothing is blooming in Colorado Springs, as yet, although I did see a couple of crabapples today that were starting to leaf out, so spring is coming. Thanks so much for the comments on the gazania. They are such spectacular flowers. My grandson, Spencer, has his tenth birthday party today. They are doing a theme of Pinewood Derby and his dad has built a regulation size pinewood derby track in their basement. Spencer and his dad and mom have carved out 15 wooden cars, all different designs, but all weighing exactly the same. Each is painted a different color. Each kid will get to choose the wheels for one of the cars which they will race and then get to keep. His dad has also made a huge spirograph, which I hope to get some shots of to share. Quite an amazing contraption. Do something fun and relaxing this weekend. Hope your weather is as nice as ours is supposed to be. I'll catch up on all your shots in the evening. It seems like everyone has really been inspired by spring lately. So MANY fantastic images! What beautiful flower and processing. Thank you so much for the wonderful comment you left on my easter image. Your encouragement doesn't go unnoticed or unappreciated. I appreciate it more than you know. Wow, I'm a sucker for blue tones like these... excellent flower shot! I am a big fan of blue flowers, and this is an excellent blue flower shot! Sounds like a very fun birthday party. Gorgeous blue flowers and details! You're right, the detail is wonderful in x-large...I really like the leaves.